Smilow® Furniture was born out of a unique Frank Lloyd Wright community not far from NYC, with this in mind, in our next few newsletters, we’ll be taking a closer look at some of the more interesting mid century architectural communities around the USA. First up? The one that hits closest to home—Usonia. For the uninitiated, Usonia was a planned community and is now a national historic district located in Westchester county. Originally, the land was purchased in 1945 by a cooperative of young couples from NYC who enlisted Frank Lloyd Wright to build his “Broad Acre City” concept. FLW designed three of the homes himself, and approved the plans of the other 44 in the community—including the one the Smilow family lived in, shown below, which was designed by Aaron Resnick. Frank Lloyd Wright believed in the flow of the land, and building within it, not beside it. He deeply believed in the power of nature, which is seen through huge glass windows, structures that use the power of the sun to their advantage, and his specification that beds should be no more than 13 inches tall to ensure that homeowners would be awakened by the sun in the morning and able to see the stars at night. 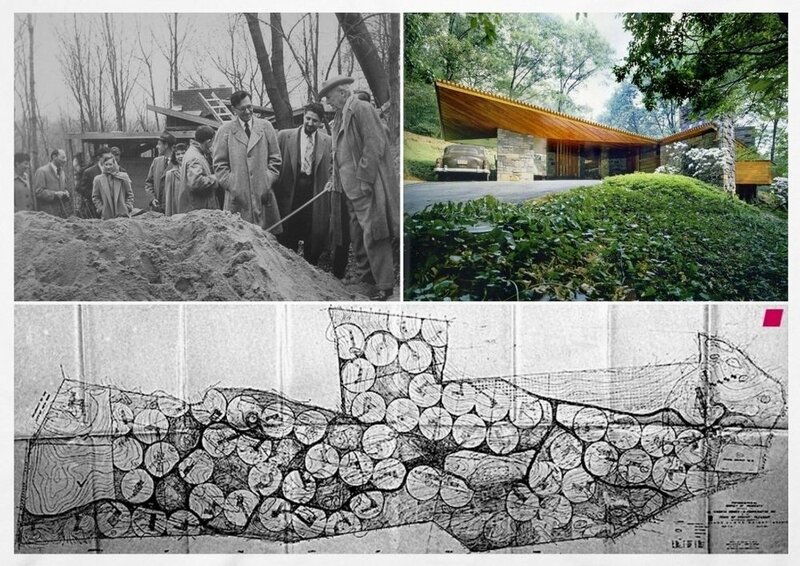 Pictured below - 2 FLW homes - interior of Reisley home and exterior of the round stone Friedman home. Usonia was named as an homage to Frank Lloyd Wright, the community is unique for a suburban neighborhood, as it holds on to the feeling of nature in a way that planned communities usually lose between roads and matching homes, and bulldozed land. Mel Smilow raised his family in Usonia, and Smilow® Furniture was and always will be inspired by nature, community, and historic architecture. Take a look at this teaser for a film in development about this historic community. The film will tell the story of Usonia through the memories of the people who built it, lived and raised their families in it. This teaser shares the recollections of several of the children who grew up there including the Smilow daughters.